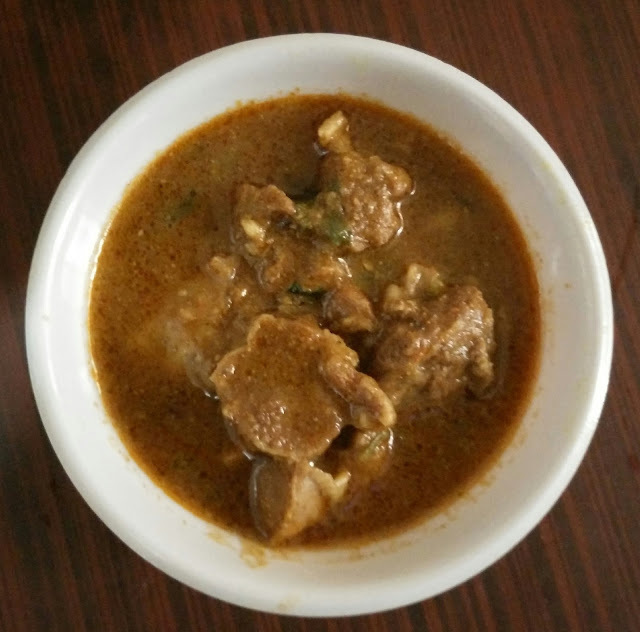 Mumbai, 3rd July 2016 : Nawabi Mutton Curry also famously known as Nahari Al Subho, is an mughlai mutton curry in which the mutton is cooked till its completely tender in a gravy spiced using exotic spices. So here is the recipe for Nawabi mutton curry or Nahari Al Subho. Now in a mixer grind the onions, Tomatoes, Cashews and almonds to a thick paste. In a pressure cooker add oil, Now add jeera. Once the jeera starts to crackle add the ginger garlic paste and cook it for few seconds. Now add the ground onion and tomato paste, and let it cook for 3 to 5 minutes or until the oil separates. Add the mutton and mix well. Now add all the dry masala and lime juice and mix well. Finally add the water and close the lid of the cooker and let nawabi mutton curry cook for 3 to 4 whistles approx 30 minutes so that the meat cooks nice and tender. Your Nawabi Mutton Curry or Nahari Al Subho is ready to be served, Garnish it with fresh coriander leaves.